Students manipulate the inner workings of the human body as they build the models, gaining a deeper understanding of how organs and systems interact. Perfect for human body centers focusing on major organs or the circulatory, nervous or skeletal systems. Each realistically detailed plastic model includes a display stand and guide with facts and step by step, photo-illustrated assembly instructions. 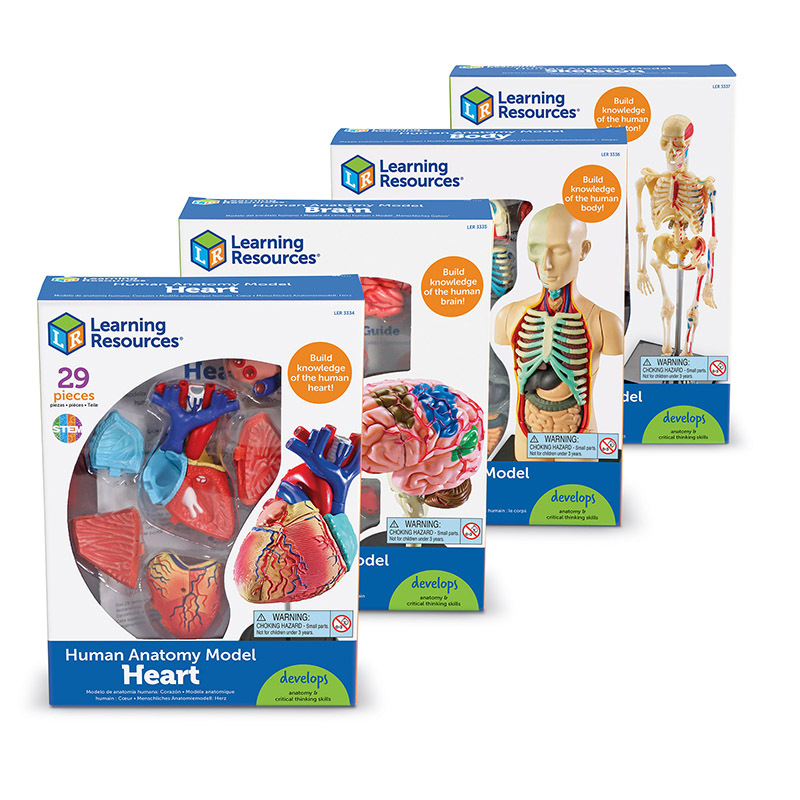 Grades 3+ Heart Features superior vena cava, inferior vena cava, right atrium, tricuspid valve, right ventricle, pulmonary valve, pulmonary artery, left atrium, mitral valve, left ventricle, aortic valve and aorta Opens when assembled so students can explore from the inside 29-Piece model measures 5"H when assembled Brain Features cerebellum, frontal lobe, parietal lobe, temporal lobe, occipital lobe, corpus callosum, brain stem, hippocampus, ventricles, insula, corpus striatum, internal capsule and lentiform nucleus 31-Piece model measures 3.75"H when assembled Human Body Features brain, skull, heart, rib cage, lungs, liver, stomach, pancreas, kidneys, small intestine, large intestine and spine 31-Piece torso model measures 4.5"H when assembled Skeleton Features skull, rib cage, humerus, spinal column, radius, ulna, hand, pelvis, femur, tibia, fibula, foot and partial circulatory system 41-Piece model measures 9.2"H when assembled.